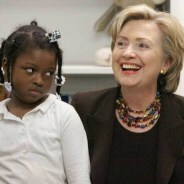 >> LesserEvil2016.com << Which candidate's done MORE harm to minority communities? Who's the "Lesser Evil"? Who's "worse"? 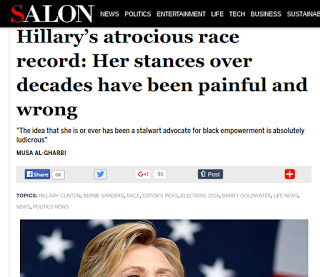 Hillary's 50 year long record of actively championing laws, candidates, and policies that have devastated the African American community, women and men, from her opposing civil rights in critical years, to championing mass incarceration which devastated African American families (and also hid from official statistics huge levels of unemployment in 1990s), to slashing aid to single moms and their children(!) 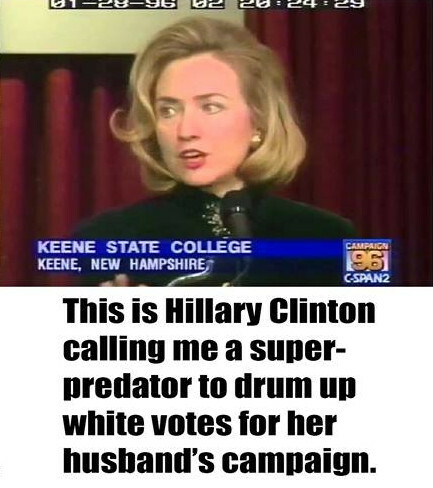 particularly hitting minority community -- and Hillary's verbal shaming of those single moms as "deadbeats" in Hillary's words, and Hillary used that ugly term against those single moms not in the 1990s but in the 2000s. Fact 1: How did Hillary Clinton start in politics? See that racist 1960s ad at left? 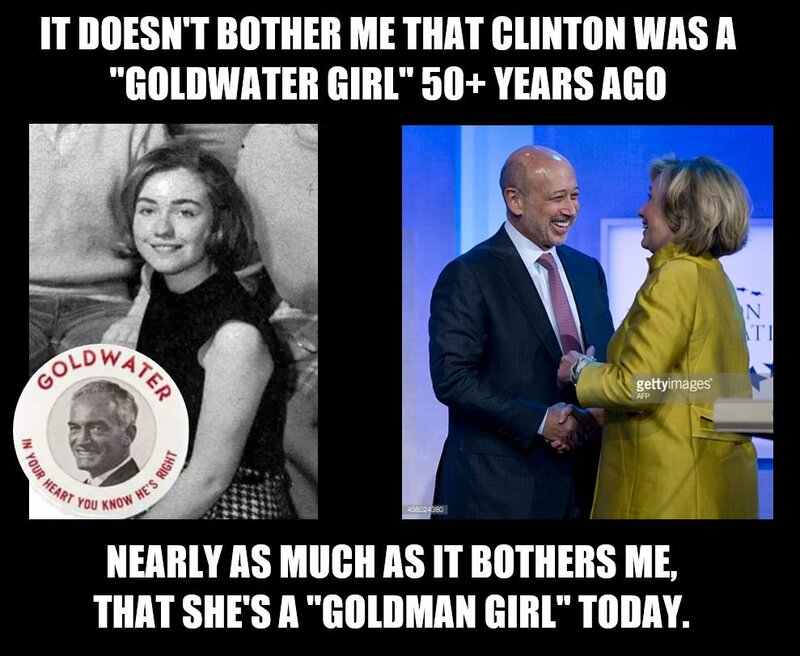 Hillary says she's proud"1 to have been a "Goldwater girl" backing the 1964 racist campaign of Republican Barry Goldwater who was against the Civil Rights Act. 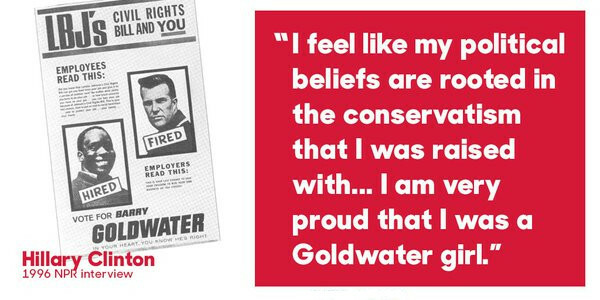 Not only that, see that racist and race-baiting political ad above on the left, by Hillary's "hero" Goldwater: "White guy loses job to a Black guy!" 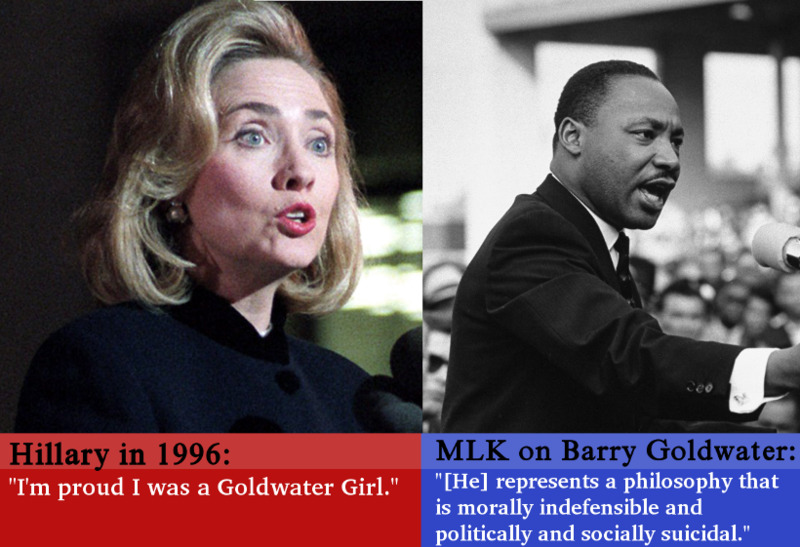 if Civil Rights passes, said Goldwater, whom Hillary not only supported in the 1960s (when even many Republicans disavowed him) but decades later, Hillary said she's "proud" to have done so!? 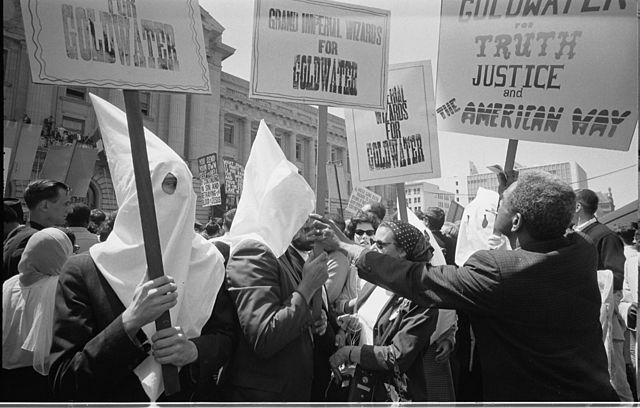 KKK members supporting Barry Goldwater's presidential campaign at Republican Convention, as an African American man tries pushing signs back. 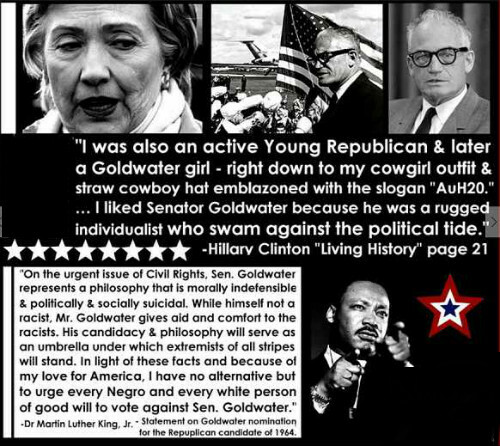 Given that even many of his fellow Republicans disavowed Goldwater & his racism; at the time, what's the excuse for Hillary having backed him? 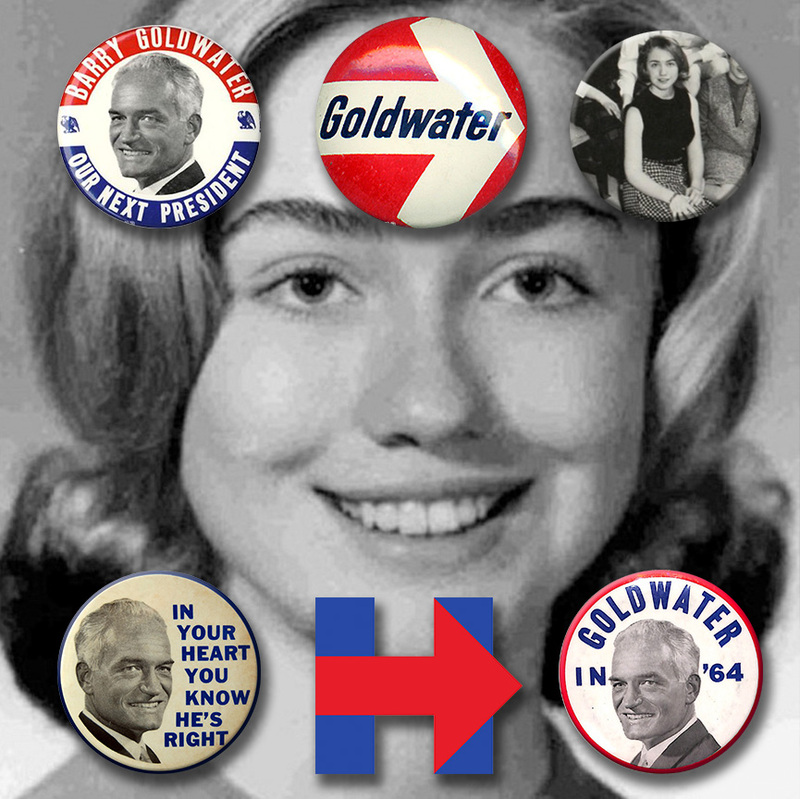 racist hero Barry Goldwater's presidential logo. It certainly fits with Hillary's statement that she's "proud"
"Ok, that was terrible but..
What about Hillary more recently?" His youtube channel includes this interview with Debbie "the Sane Progressive"
and who has her own very successful channel. Who is worse? Hillary or Trump? Disturbing Fact 2: Hillary this election season was taking "legal bribe" money from for-profit companies/lobbyists whose bottom line & business model relies & depends on mass-incarcerating vulnerable Americans. "Private" means For-profit prisons. Companies whose vicious business growth model falters if ever there's fewer people locked up in America. Hillary happily took their $$ until exposed..only then did she stop. Shameful! Watch as Bruce Carter, founder of Black Men for Bernie speaks out on how a Hillary Clinton presidency scares him more than a Trump Presidency in how much damage would occur. "People think they don't have a voice so 'we're going to play it safe and go with Hillary, she can't be as bad as Trump' Well, you know what? Those new documents that were released Jimmy, what do you think of that? Trump can [attack the press] but can't stop them from printing. But [Hillary camp demanded & got right to screen articles approve/not, before publication] the DNC stopped them from printing! I don't think [media] people call up Trump and say: 'Is this [proposed article] cool with you?' You know what I'm saying? So in that essence, that's why I say Hillary is more dangerous than Trump. "-Tim Black, African American progressive journalist and talk show host. 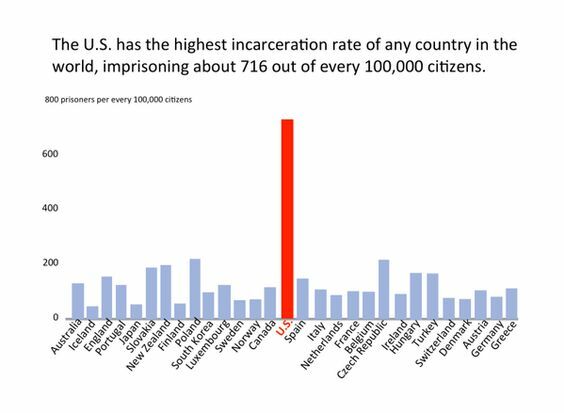 "Lock 'em up" mass-incarceration worse than Reagan's, under fear-mongering race-baiting vote-getting by Bill and Hillary Clinton's Crime Bill and "watch out! Those super-predators gonna get you!" 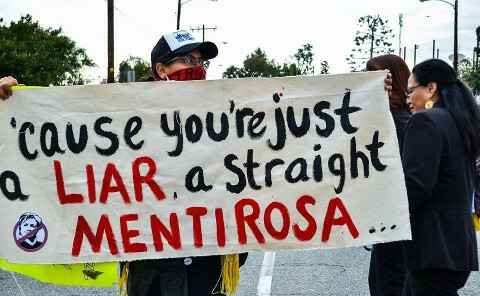 rhetoric. U.S. prison population did start to increase before the Clintons, but did they reverse that? Or stop further increases? Or at least slowed it down? No, prison population kept increasing even more rapidly, with lower income whites and minorities hit the hardest, very often for no-victim "offenses" like possessing (or being next to someone possessing, or living with someone possessing) a small amount of marijuana — in no small part thanks to 1990s draconian Crime Bill that not only Bill but Hillary Clinton vocally championed. 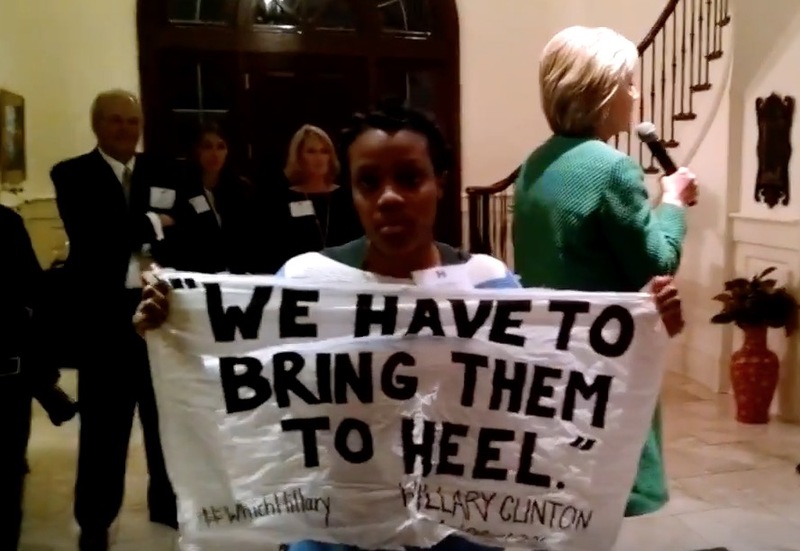 The fuller version of Hillary's infamous "super-predator" comment is even more disturbing - using coded race-based language she didn't just say these kids are "super-predators" who have to be "brought to heel" but also de-humanized them (and maybe looked in the mirror and thought of herself?) saying they have absolutely "No conscience, no empathy." 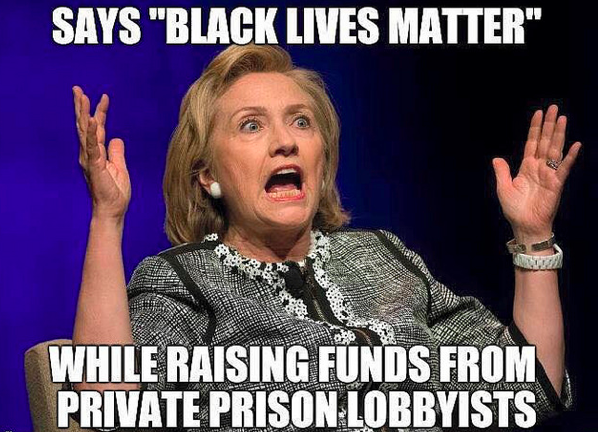 While mass-incarceration hit minority men hardest, Hillary not only supported but, again, vocally championed and helped sell to America on an all-out assault that his minority women hardest: her so-called "reform" of Welfare. Hillary's vicious slashing aid to (and shaming of) single moms who were struggling. 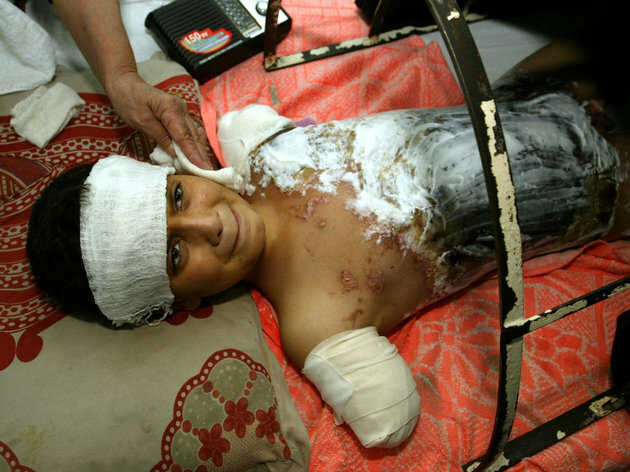 And of course, slashing aid also to their children. Again this included white moms and kids either working class and poor or just going through a difficult time in their regional economic cycle — but minorities were not only hit hardest, given the higher poverty and unemployment and under-employment rates..
"Back then, Bill Clinton was the standard-bearer for the New Democrats, a group that firmly believed the only way to win back the millions of white voters in the South who had defected to the Republican Party was to adopt the right-wing narrative that black communities ought to be disciplined with harsh punishment rather than 'coddled' with welfare. Reagan had won the presidency by dog-whistling to poor and working-class whites with coded racial appeals: railing against 'welfare queens' and criminal 'predators' " notes prominent African American legal and historical scholar Michelle Alexander. 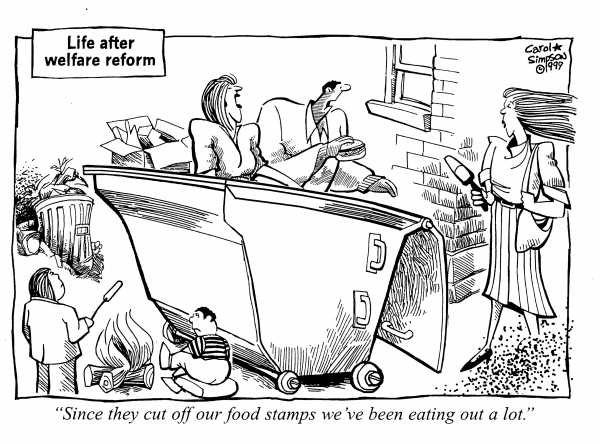 "The 'welfare-reform' legislation that he signed — which Hillary Clinton ardently supported then and characterized as a success as recently as 2008 — replaced the federal safety net with a block grant to the states..added [often lowest common denominator] work requirements [below skill-level what the person was capable of contributing to society] ..and slashed overall public welfare funding by $54 billion"
We can add more. This is what Hillary ardently supported in the 1990s — but in the 2000s? Even then Hillary referred to any such stay at home mothers receiving a single dime of aid as "deadbeats." 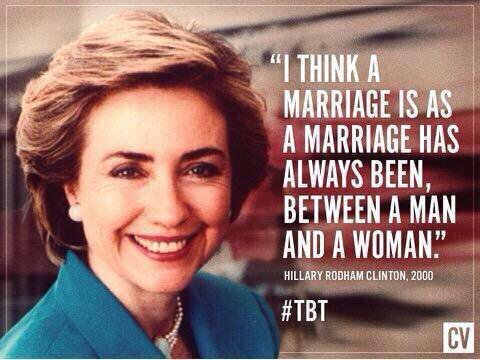 That's Hillary's words about single mothers going through hard times. 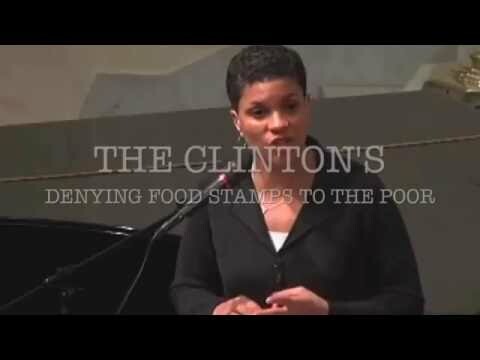 Michelle Alexander: "Experts and pundits disagree about the true impact of welfare reform, but one thing seems clear: Extreme poverty doubled to 1.5 million in the decade and a half after the law was passed. What is extreme poverty? US households are considered to be in extreme poverty if they are surviving on cash incomes of no more than $2 per person per day in any given month." 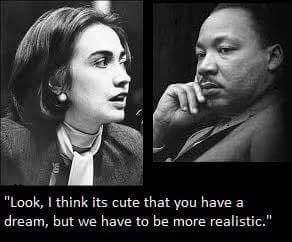 Supporting Pro-Segregation racist in 1960s and 4 vicious-to-minorities policies not enough for you to be a deal-breaker? Here's #5. Brutal incarceration and slashing aid-to-moms but "good jobs"?? 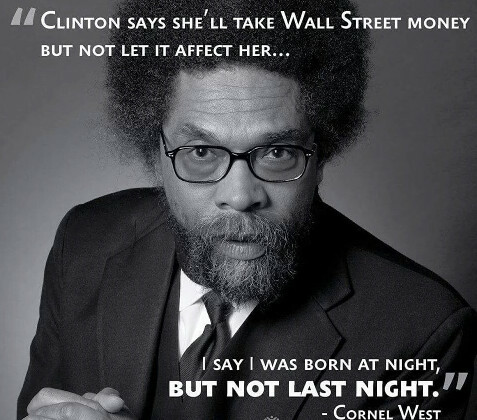 Think again -- Jobs disaster for African Americans under the Clintons' 1990s "Tough Love" policies towards working Americans and the Clintons' "pragmatic 'centrist' (really, reactionary) ideology. "An oft-repeated myth about the Clinton administration is that although it was overly "tough on crime" back in the 1990s, at least its policies were good for the economy and for black unemployment rates. The truth is more troubling. As unemployment rates sank to historically low levels for white Americans in the 1990s, the jobless rate among black men in their 20s who didn't have a college degree rose to its highest level ever." 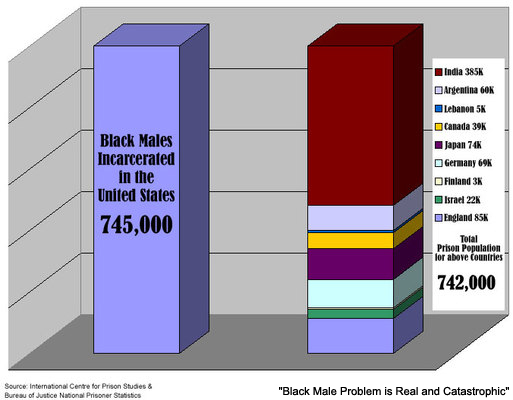 Government statistics like [official] poverty and [official] unemployment rates do not include incarcerated people. As Harvard sociologist Bruce Western explains: "Much of the optimism about declines in racial inequality and the power of the US model of economic growth is misplaced once we account for the invisible poor, behind the walls of America's prisons and jails." "This figure was never reported. Instead, the media claimed that unemployment rates for African Americans had fallen to 'record lows,' neglecting to mention that this miracle was possible only because incarceration rates were now at record highs. "Young black men weren't looking for work at high rates during the Clinton era because they were now behind bars — out of sight, out of mind, and no longer counted in poverty and unemployment statistics" -African American lawyer and scholar, Professor Michelle Alexander. "From the crime bill to welfare reform, policies Bill Clinton enacted — and Hillary Clinton supported — decimated black America." Many feel that the death Penalty — executions carried out by the state — violate their ethical, religious, and "two wrongs don't' make a right" principles and studies show they are not effective. 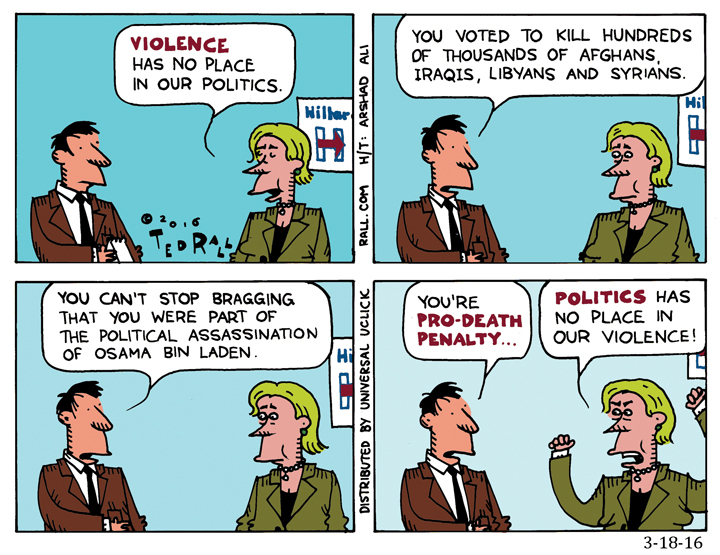 Yet Hillary Clinton, in addition to giving a "death penalty" to young men and women in the military (and innocent civilians abroad) by voting for wars based on lies (Iraq) and spearheading disastrous "regime change" wars that only lead to more civilians dying and to ISIS....she also shows yet another anti-minority policy by being FOR the Death-Penalty, even in our age of mass-incarceration, tampered-evidence scandals, and people on Death Row later (sometimes, tragically, after their execution — their murder — by the state) being exonerated by new (e.g. DNA) or by previously illegally suppressed evidence. Three strikes and you're out? Six is enough! Deal-Breaking Fact #7 Helped, voted for, and even championed and outright spearheaded policies mass-murder of hundreds of thousands (100,000's) of mostly brown-skinned innocent civilian men, women, and children in country, after country, after country. Iraq was just the beginning. 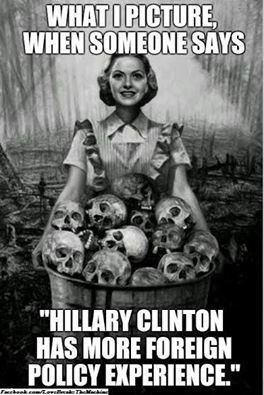 There's the horrific ISIS-takeover disaster in Libya where Hillary didn't just vote for, but was the strongest voice withing the Obama cabinet for that disaster, and the piles of dead bodies of non-white, brown-skinned, poor, including a very large portion of the very "women and children" Hillary never tires of telling us she "cares" so much about. 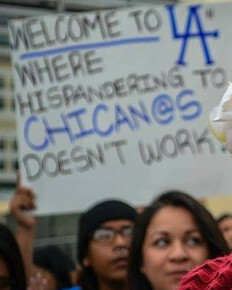 How's that for treatment of minorities? the charge (not "just" voting for) repeating scenes just like this, in Libya. How many must die, in how many countries, before it's a deal-breaker and you won't vote for a candidate? Multiple countries and well over a million devastated isn't enough for you? What would you personally prefer? What would be worse? To have you and your causes insulted? Or to see your spouse and children bombed, killed, or crippled for life? Isn't the answer clear? The least we owe to non-white victims abroad and minorities here in the U.S. is to face the uncomfortable truths such questions bring. Which candidate is the real "Lesser Evil"? 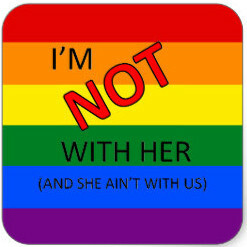 It isn't Hillary. And without diminishing the ills of the surprising but actual "Lesser Evil" (DT) to act accordingly. To do otherwise is not to respect the past decades' and potential future victims of Neocon [link coming] Hillary Clinton, but to be instead privileged in the knowledge of assumption that you and your loves ones are insulated from such devastation. There's no more excuses for not voting for the Greater Good (Dr. Jill Stein) out of fear that Trump might win. In that unlikely event, we would actually get get "The Lesser Evil"
See Women's Rights section and the Treatment of Muslims for more about Hillary (and Bill) Clinton's backing, selling arms to, and as close or even closer-than-Bush Dynasty links to the most reactionary, totalitarian regimes in the world who are oppressing non-whites and Muslims (one key portion see here). New: In addition to preceding link on how Hillary gets a lower score than DT as far as Treatment of Muslims, see also dedicated must-see section on Hillary's 'Special Relationship' with, and extreme abuses of, the world's most reactionary human rights abusing dictatorship: Saudi Arabia. "Benghazi Scandal" claims are hypocritical and largely right-wing spin-- except for the part that is truly and devastatingly another scandal Hillary Clinton holds profound responsibility for. Hillary is the most-hawkishly right-wing and simply put, hard-core Neocon candidate to ever run as a Democrat, and far more hawkishly and dangerously militaristic and pro-war than "lose canon" Trump.  We've contacted allies for suggested additions..new items may be added above or below. 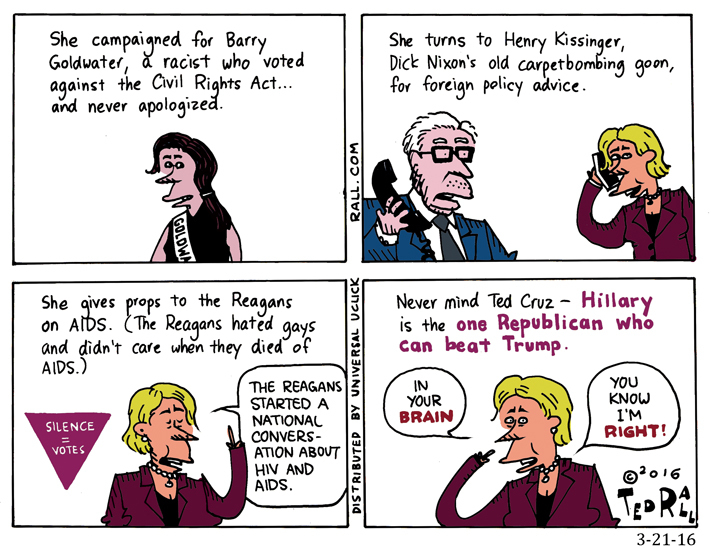 →Hillary's record is Brutally Anti-Women! → Hillary's long record of Islamocidal policies. That's no hyperbole; because, intentions aside, literally that's what they've been. →Hillary, far from "Lesser Evil" is the Greater Threat to world peace and is adored (Trump is not) by war-hawks. Fight for a last-minute miracle President Jill..
After reviewing this, we hope you'll agree that "even"
Dr. Jill Stein for President! And at Best? After all the huge Surprises (Bernie going so far, DT nomination, latest HRC health problems) we've seen? 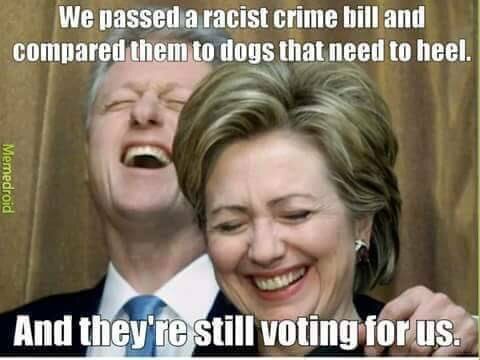 "HORRIFYING"-- 150% increase in Extreme Poverty due to Clintons' Welfare "Reform"